With digital technology continuing to revolutionise the way companies do business, the study of IT, intellectual property (IP), and commercial law has never been more relevant. Drawing on Southampton’s world-class expertise in law, computer science and Web science, this LLM provides specialist knowledge that will be invaluable in today’s e-commerce sector. This masters programme is designed to meet the growing need for specialists who understand – and can anticipate – the legal issues that arise when the worlds of IT and commerce meet. Tackling topics such as IP, e-commerce, data protection, and intermediary liability, it offers a thorough grounding in the current legal frameworks and emerging debates that impact on today’s digital and data-driven economy. 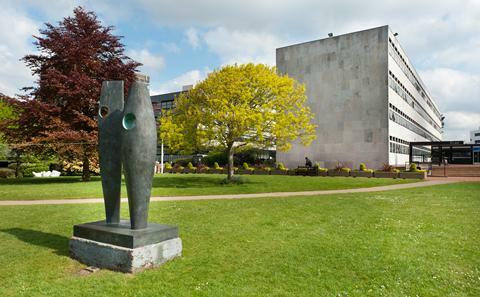 Interdisciplinary in nature, the course draws on Southampton’s world-renowned expertise in law, computer science and Web science, exposing you to cutting-edge developments in all three fields. Part of a supportive and dynamic law school community, you’ll learn from academics who are at the forefront of their specialist areas. They bring insights from their practice and research to their teaching; you’ll also learn from guest lecturers from major corporations. You’ll graduate with a sound understanding of this important and ever-evolving area of law, advanced critical thinking skills and the ability to apply your knowledge commercially, ensuring you are highly sought after by businesses and law firms. We welcome applications from recent law graduates or graduates from disciplines with a strong legal component who are keen to specialise in this fascinating field of law, as well as those with professional experience who are seeking to advance their career or take it in a new direction. We attract high-calibre students from around the world, enabling you to build a network of friends and contacts that will prove invaluable as you progress in this global sector. This course is offered on a full-time basis (one year) or part-time basis (two years). You’ll choose four modules, or the equivalent in modules and half modules, from an extensive range. You’ll also complete a dissertation. Global Copyright and Trademark Law and Policy. In this module you’ll learn about the fast-changing field of copyright and trademark laws – both areas that are currently subject to review and reform in numerous countries worldwide. The module provides a critical overview of recent legislative, policy and judicial developments relevant to copyright and trademark law, adopting a comparative perspective that takes into account a number of jurisdictions around the world. Online IP Enforcement. Highly relevant at a time when creative works are increasingly produced and distributed in digital format, and when more and more goods are sold in virtual marketplaces, this module looks at the issue of online copyright and trademark infringements. You will investigate issues and possible solutions relating to online enforcement of IP rights, looking at policy debate, legislative initiatives and case law developments across the world, particularly in the EU, UK and US. You can also choose from options in other areas of law, enabling you to gain additional specialisms and put your IT and commercial law studies into context. The topics on offer reflect the Law School’s expertise in areas such as international trade law, corporate governance, international commercial arbitration, maritime law and secured transactions. The range includes modules that are unique in the UK, on the subjects of ship finance, carriage by air and the law of ship sale and purchase. Over the summer you’ll undertake your own research for the dissertation, with support and guidance throughout from an academic supervisor. This is another opportunity to personalise your course, as you’ll be able to immerse yourself in a topic that interests you and that will help you to advance in a particular sector or field of law. Topics chosen by past graduates include aspects of copyright, data protection, the right to be forgotten, surveillance, database rights, trademarks and anonymisation. The University of Southampton is a world-renowned centre for law, computer science and Web science research, and therefore offers outstanding opportunities for those interested in IT and commercial law. The course is underpinned by research conducted by academics and PhD students within the Institute for Law and the Web, a unique, interdisciplinary research centre that brings together the University’s unrivalled expertise in law, computer science and Web science. We organise an annual conference on IT and IP law, bringing together Europe’s finest legal minds. Students can take advantage of talks and events organised by the Law School, the University’s Web Science Institute, Electronics and Computer Science department and Academic Centre of Excellence in Cyber Security to further inform their understanding of emerging IT and e-commerce issues. You’ll learn from academics who are not only experts in law as it is applied today, but are active in shaping its development. They are involved in cutting-edge research and are invited to contribute to law reform initiatives and advise on the impact of new legislation, enabling them to bring the latest thinking to your course. Dr Sophie Stalla-Bourdillon is author of legal articles, book chapters and books on intermediary liability, data protection and privacy, information security, and intellectual property. Her latest research explores areas including the liability of internet intermediaries such as internet service providers, Web 2.0 platforms and search engines, the role of hosting providers in relation to malicious web pages, and anonymisation practices. Her advisory roles include membership of an expert group formed by the Council of Europe on intermediary liability. Dr Eleanora Rosati’s research interests include copyright, trademark, IP and internet law issues, looking at these topics mainly from an EU and UK perspective. She is also an editor of the Journal of Intellectual Property Law and Practice, and a Door Tenant at a specialist IP set in London. Before joining academia she worked in the IP departments of international law firm Bird & Bird LLP, in Milan and London. You’ll benefit from your tutors’ link with international and local law firms and with commercial organisations. Guest speakers will give you insights into current and emerging issues in IT and commercial law; recent speakers have included representatives from Google, Vodafone and Sanoma. We are regularly approached by companies and law firms interested in recruiting graduates with the specialist knowledge that this course provides. The Law School offers prizes sponsored by businesses for high-performing LLM students in some modules. These can take the form of monetary awards or work placements, which are a great opportunity to gain professional experience and build networks. Recently students have undertaken placements with law firms such as Campbell Johnston Clark and Clyde & Co. Explore two exciting and interrelated legal fields and gain an advantage in the world of business and commerce. The University of Southampton has a global reputation for excellence in law, computer science and Web science. A high degree of flexibility, enabling you to tailor the course to serve your academic and career interests. Includes two specialist modules: Global Copyright and Trademark Law and Policy, and Online IP Enforcement, as well as a variety of guest lectures from leading professionals and companies facing issues at the forefront of technological advancement. Modules are taught by world-leading specialists, many of whom are the authors of key text books in their areas of expertise. Our strong industry links and extensive career support will help you build professional networks and achieve your ambitions. The 2014 Research Excellence Framework rated 100 per cent of our research as world leading or internationally excellent for the research environment we provide to staff and students. In addition, your tutors on the LLM IT and Commerce will circulate relevant vacancies and use their knowledge of the sector to offer tailored careers advice. You can also take advantage of external professional networking events in London, which is just over an hour from Southampton by train. Your specialist knowledge, professional skills and ability to think critically will ensure you have a competitive advantage when applying for roles that require expertise in the various aspects of IT and commercial law. This degree is excellent preparation if you are interested in becoming a specialist advisor within a law firm, joining an in-house law team within a global corporation or EU and international institutions as a legal or policy officer, working as a public affairs professional or within the constantly expanding e-commerce and data-driven business sector. A Facebook page https://www.facebook.com/groups/133150957039932/ has been set up to help you to keep up to date with the latest issues and debates in IT and commercial law. Academics and students post media articles, news items and legal decisions for online discussion. As well as strengthening your legal skills and understanding, the modules will help you to develop transferable skills such as team working, communication, critical appraisal and logical reasoning. Working closely students from diverse backgrounds also means you’ll gain an insight into other cultures and professional practices that will be crucial in the workplace. You’ll receive immediate feedback on your work during class, enabling you to identify strengths and areas for improvement. Formal assessment varies by module, but will include exams and coursework as well as your dissertation. The LLM Challenge is a chance to put your learning into practice, exercise your intellectual capabilities and develop your collaborative working and leadership skills. Students from all our LLM pathways are assigned to a team and given a current topic to debate, competing for a monetary prize. You’ll benefit from unlimited access to an extensive range of specialist law journals and online databases held by our excellent library service. Library seminar rooms are available for group work and peer discussion, and the Law School’s facilities include a purpose-built moot room. Our degrees are intellectually challenging, but you’ll receive plenty of support in our friendly, informal Law School community. Our academics get to know students well and can provide advice and guidance tailored to their needs. Every student is allocated a personal academic tutor who can advise on course-related matters, and you’ll be able to talk to your module tutors about any subject-specific queries. You’ll also have access to a wide range of University academic and welfare support services should you need them.